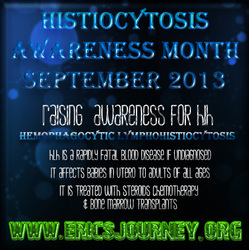 Histiocytosis is a group of 'rare' diseases that affect the immune system. If untreated, they are fatal. 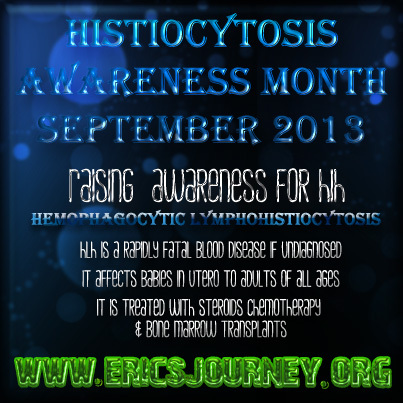 LCH, HLH, JXG, ECD, DI and RD are the acronyms used for these diseases that were once too 'rare' for a name, so they were coined by the process by which they affected the body. 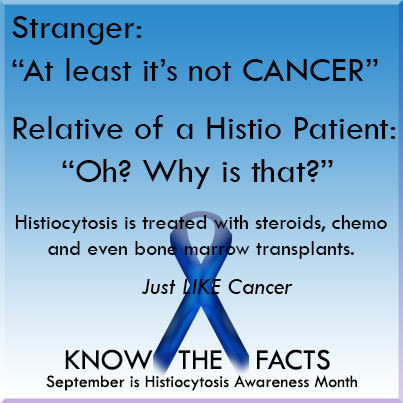 They occur when a white cell known as a histiocyte over produces too many of these. This can cause organ disfunction/failure and tumor growths. 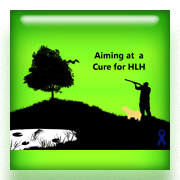 For a list of organizations with additional information and resources for HLH check out the HLH Resources tab above. 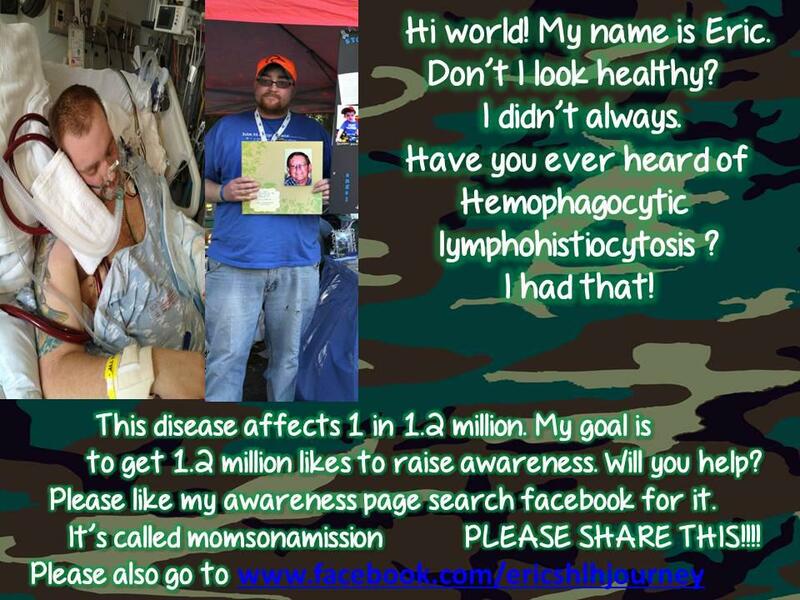 The power of knowledge is key - KEY in raising awareness! Education is important in all aspects of life. Wether you are learning how to tie your shoe, ride a bike, get a degree or learn a new hobby - knowing the Who? What ? When? Where? Why? How? How many? applies. Who does HLH & Histiocytosis affect? It can affect EVERYONE! Young & Old - It can even be detected in utero & treated, but know this is very unique. What causes is to happen? Some cases are gentic. Others are known as secondary cases and these can be caused by bacterial infections, viruses, malignancies or cancers and other autoimmune diseases. When does HLH or Other forms of Histiocyosis occur? 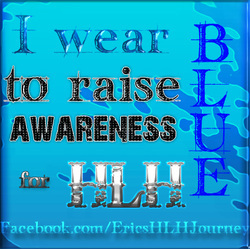 HLH can occur at ANY age and ANY time throughout life. The majority of genetic forms expose themselves shorty after birth or during adolesence. 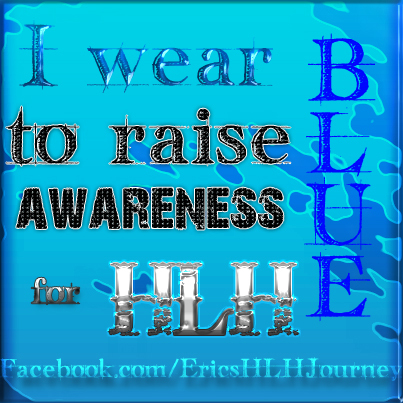 With increasing awareness more adults with primary or genetic forms of HLH have been diagnosed in recent years. 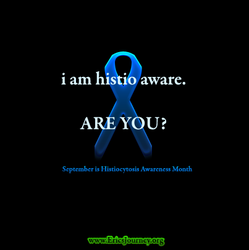 Secondary forms of HLH can occur at any age. 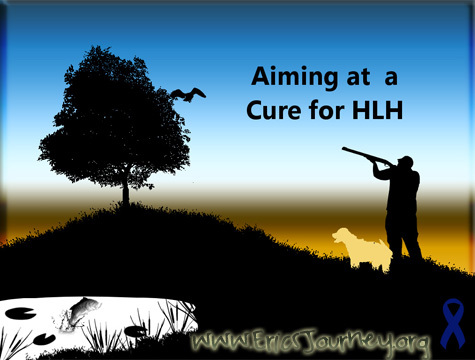 It is believed there is a 'trigger' point or factor that causes the HLH to activate, but with limited research it has not yet been discovered. Where does it affect your body? Each disease can affect everyone differently. HLH is commonly known to affect the liver, spleen, cell counts and even bone marrow. many patients have severe lung complications with pleurisy that is often mistaken for a 'case of pnumonia' diagnosis at first glance. Sepsis diagnoses are also common in these events of severe organ complications. 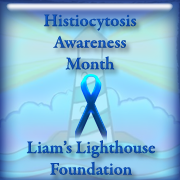 View the HLH Factsheet from the Histiocytosis Association here. 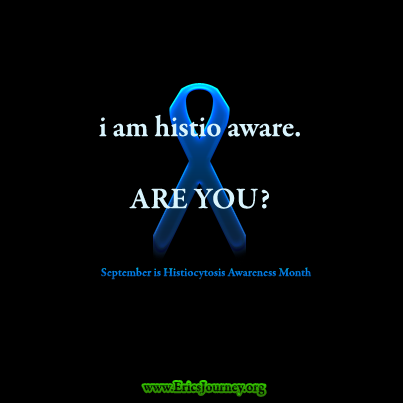 We reccommend you visit www.Histio.org to learn more about each disease with their easy to view and print fact sheets! How will I or my loved one be affected by Histiocytosis? 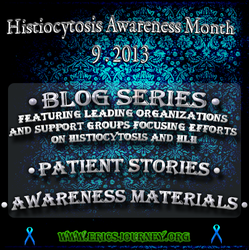 Histiocytosis is a disease that is based on differential diagnosis. There is no single specific test. Sometimes macrophages can be found in lab tests like a bone marrow biopsy. It can be difficult to understand why this is happening or why you may hear varying statistical outcomes on treatment and short and long term survival and life changes. 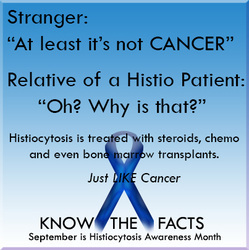 Typical treatments often include sterroids, chemotherapy and the possiblity of a stem cell or bone marrow transplant. The patient and their family & friends may have extremely similar feelings, needs and discomforts that a cancer patient may have. Many patients/family/friends often have feelings of anger towards the lack of others understanding how serious this disease is. A common comparison we say is "HLH is similar to Leukemia"
>> One doctor explained to us that HLH has multiple individual 'bad' cells created around the same time, whereas, cancers are a bad cell that multiplies more bad cells. This is how HLH can spread so quickly - depleting red cells, platelets and other rapidly dividing cells abilities to 'turn off' the immune system. We, the Majusiak Family, understand on a firsthand basis of perspectives from the patient (male), the wife, the parents of an adult, family, friends and workplace situations. You do NOT have to be alone. For more information from others experiences please visit our Resources page for links to organizations and online support groups. How can I ? Help. Help is what people ask the most. What can I do? they commonly say. For some of us it's not easy giving up our routines, but the Journey with HLH isn't often a short one for patients, particularly survivors. The easiest thing for us in the beginning was to let people cook meals. We often asked for them to be in tinfoil and frozen so we could just throw them in the oven and discard the trash when we were done. paper products too puhlease! 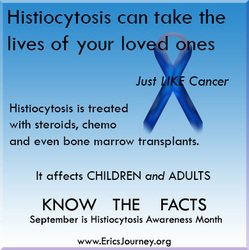 Eric's parents and myself (amanda, Eric's wife) often spent 10-12 hour days at the hospital. The first few weeks weren't so bad, but as time went on we became numb to this new daily routine and it was so much easier when we didn't have to focus on cleaning or extra dog walks at 1am if someone else came over while we were at the hospital. How many ? How many more have to suffer? 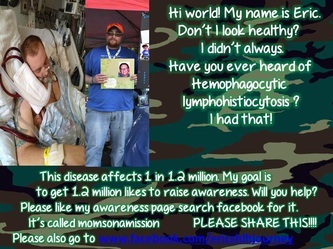 How many have to be misdiagnosed? How many days must we spend trying to take one small step? 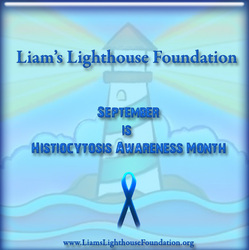 How many SHAREs can we get to help make a difference in someone's life that is affected by HLH or another type of Histiocytosis? There are links all over this site to help you share the knowledge you've learned by visiting our site - or maybe you already knew, but want to help us make a difference! The images below can be shared on your website, blog, facebook, twitter, instagram or other social media site! We ask that you provide a direct link back to any of our sites pages or social media sites so our sharing impact can be that much greater! Share these photos on your Facebook, Twitter & Instagram!! Click an image to open the gallery to save photos. 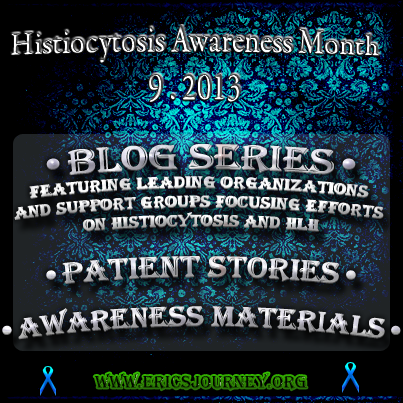 Check out our Histio Awareness Blog for Histiocytosis Awareness Month for more information on leading organizations, local organizations, patients stories and more! There's no need to worry if funds are tight! With today's economy, we are the first to know how hard it is to earn your dollars! You can Contact Us for volunteer opportunities or visit our Events page to find local opportunities for you to be a part of! If you would like to help us continue our efforts of raising awareness directly, please email us with how you'd like to help and we can discuss our many options! Some examples others have done in the past are: volunteer at one of our events, a donation of funds to purchase awareness wristbands, free printing services, donation of items to sell at awareness events and more!